BUENOS AIRES, Argentina - A Refugee Olympic Team will compete in the Tokyo 2020 Games, following the ground-breaking debut of refugee athletes in the Rio 2016 Summer Olympics. Addressing the IOC session before the vote, Yiech Pur Biel, UNHCR High Level Supporter and member of the Rio Refugee Olympic Team urged delegates to grasp the "unique opportunity to build upon what has already been achieved and... have a second Olympic Refugee Team in Tokyo 2020." Ten refugee athletes from four countries came together in Rio de Janeiro, as the Refugee Olympic Team. Among them were two swimmers, two judokas, a marathon runner and five middle-distance runners competing under the IOC flag, highlighting the IOC's continued commitment to the refugee cause. "In 2016, the Rio refugee team captured the imagination of people around the world and showed the human side of the global refugee crisis through sport," Grandi said in a statement. "I'm delighted that this tradition is to continue in Tokyo. Giving these exceptional young people the opportunity to compete at the very highest levels is admirable." The athletic prowess and resilience of the Refugee Olympic Team in Rio was a tribute to the courage and perseverance of all refugees - at a time when the number of people displaced by violence and persecution was at the highest level since the Second World War. 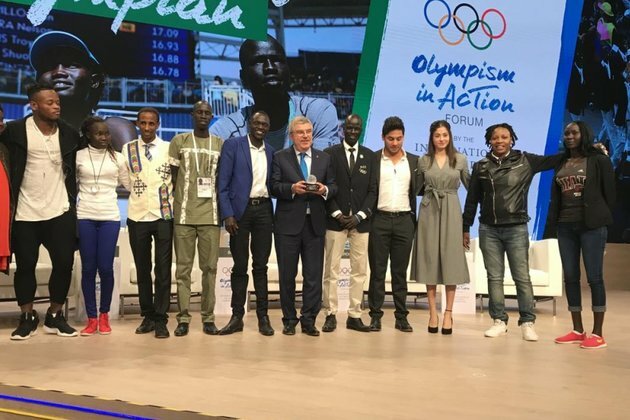 This week at the IOC's Olympism in Action Forum, the entire Refugee Olympic Team was reunited in Buenos Aires for the first time since 2016. They took advantage of the reunion to advocate for sport as a tool for peace, and recalled the hope that their endeavours had given to refugees around the world. Yusra Mardini - Refugee Olympic Athlete and UNHCR Goodwill Ambassador - said Tuesday's decision would give refugees everywhere another chance to dream. "I'm proud I represented the Refugee Olympic Team once and am so happy that a team will compete in Tokyo again," she said. "I'm going to work as hard as I can to earn a spot in the team. I wish the best of luck to all the other refugee athletes in the world." "This is the continuation of an exciting, human and Olympic journey, and a reminder to refugees that they are not forgotten."